Feelings of connectedness and safety are usually relayed in nonverbal ways that therapists too often ignore: through small moments of eye contact, touch, and ultimately the sharing of joy and delight. But how do you go beyond words to cultivate a deeper sense of attachment in therapy? According to Dafna Lender, program director of The Theraplay Institute, incorporating playful exercises in your sessions is great place to start, and it works equally well with adults as with kids. Here, she demonstrates three of her favorite techniques. Dafna Lender, LCSW, is the program director for the Theraplay Institute and a certified trainer in Dyadic Developmental Psychotherapy. As Dafna explains, exercises like these can quickly establish security and trust. 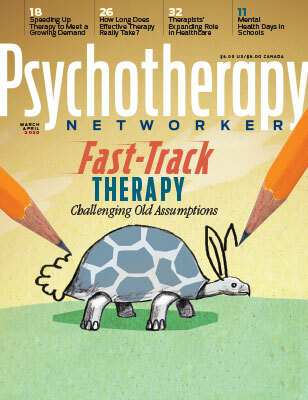 Click here to read her recent Networker article, "A Playful Path to Attachment," where she shares the story of how she used the Surprise Paper Punch exercise to help a struggling mother and her adopted daughter learn a different way to bond.